A few weeks back I wrote a post called Now I know I’m crazy. I was referring to the fact that I had just started an MBA course, while still working full-time, just as my last kid flew the nest. That is crazy, without a doubt. In this post, I want to talk about another kind of crazy. Now, for those of you who aren’t on Ravelry (which is the greatest knitting tool ever devised), I will digress for a minute. Each user on Ravelry has a projects page, where they store their knitting projects. Below is a screen shot of part of my projects page. Each photo is of a knitted project; you can click on the photo to pull up an individual page where details and more photos can be stored, including start and end dates for the project, pattern details, yarn used, modifications, notes, etc. These projects can be organized in any number of ways, but the majority of knitters use the default options whereby your WIPs (works in progress) come first, followed by your finished projects in reverse chronological order. 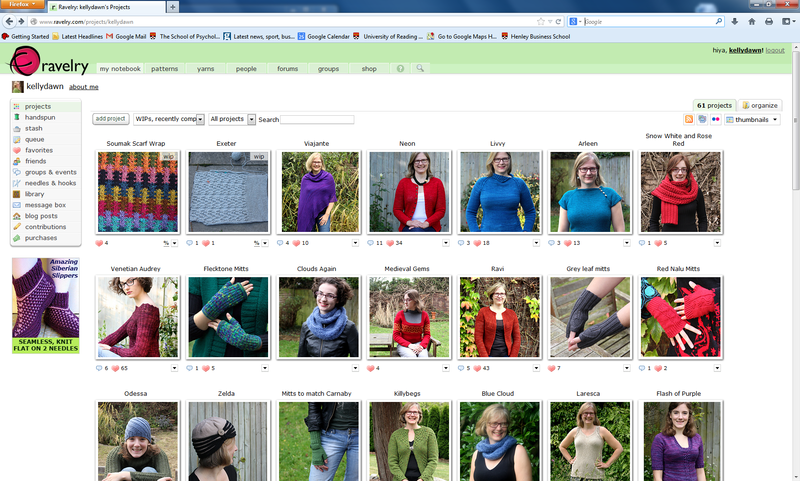 The first two photos, in the top row left, show my two WIPS – the Soumak Scarf Wrap and the Exeter jacket. If you have very good eyes and you squint carefully at this screen shot, you will see that the top right-hand corner of these two photos is marked “wip”. The other photos show my completed knitted projects in order of finishing – the purple Viajante shawl was just finished last week; the green Flecktone mitts in the second row where finished in early January this year (this has been a rather slow year for me on the knitting front) and the rest were among the projects I finished in 2012. By definition, a WIP is a project which has been cast on (thus, is “on the needles” as we knitters say). I normally try to have between 2 and 5 WIPs going at any one time. Two, because it is good to have more than one given the vagaries of interest and time and concentration (i.e. some projects need lots of quiet and focus and others can be done while simultaneously cooking dinner and helping your kids with their homework). Five because, well, its hard to keep track of too many; experience tells me that five is about my upper limit. Now, I spend a lot of time surfing Ravelry, looking at other people’s projects, patterns, etc. When I see something I like, I click on that knitter’s project page. My eye first goes to the number of projects – on my page above you can see that it says ’61 projects’. That means that I have loaded up details and photos of 61 projects (these are just those that I have knitted since joining Ravelry, though even some of those I haven’t bothered to enter). Note that this 61 includes the two WIPs and 59 completed projects. You can often make a sort of initial assumption about the knitter by the number of projects – someone with less than 10 is likely a beginner. Someone with 100 is likely pretty good. (These often have no correlation to reality; the knitter with 10 may have knit hundreds of beautiful sweaters over a long lifetime and has only just discovered Ravelry, or perhaps just got access to a digital camera; the knitter with 100 may have just knit 100 garter stitch dish cloths and showcased each individually.) Then, I scroll down the page and check out all of the projects. I click on those I particularly like and take a closer look. Sometimes, I will make comments, or add someone to my friends so I can follow their future knitting activity. The other day, I came across someone who had over 300 projects. When I scrolled down, I noticed that she had lots of WIPs. I mean LOTS of WIPs. For each one, she had a photo, of a knitting needle with a few rows of knitting on it, and a link to the pattern and the type and amount of yarn set aside for the project. I couldn’t help myself, I started counting. This knitter had over 240 WIPs. I hope not to offend anyone by saying this, but this strikes me as totally insane. This is CRAZY. Each of these WIPs is cast on and is thus “using” a knitting needle, or set of needles. Let us say that your knitting needles cost $5 each (using US currency here for no particular reason, and probably underestimating the cost of a needle). This means that you have $1200 worth of knitting needles wasting away in your WIP pile. This means that, unless you own a knitting store or manufacture the needles yourself, it is very likely that you never have a needle handy when you want to cast on, and will have to keep buying more and more and more. Each of these projects takes yarn. Let us say that, on average, each project takes $30 worth of yarn. (I will point out, that for me at least, this is a wild underestimation of yarn costs.) This means that you have $7200 worth of yarn sitting around, dedicated to WIPs (thus, I will repeat, “on the needles”). This means that you need to have some way to keep track simultaneously of 240 patterns, 240 swatches, plus notes and modifications for each one. I know that Ravelry makes this easier, but still this seems ludicrous. For example, I have two WIPs at the moment, but every time I pick up my Exeter jacket after having been knitting something else, I have to spend some time re-familiarizing myself with the complex cable patterning, and looking over my notes to get back on track with where I left off. Plus, my fingers have lost the “feel” for the pattern, and I sometimes have to re-learn the finger memory. With 240 projects, you will never feel on-track and will constantly be re-familiarizing yourself with each one. I don’t know about you, but my tastes change. The project that I found pretty two years ago, may not appeal to me today. Trends in yarns, patterns and colours change all the time. Why have 240 projects picked out today, each with yarn and resources already committed to it, when tomorrow you may not even like them? In 2012, I knit 13 projects. That was a pretty average year for me. If I steadily knit away at this rate, finishing 13 projects per year, it would take me OVER 18 YEARS to finish those 240 WIPs. And that is assuming that in that 18 years I don’t cast on anything else. Even if you knit three times as fast as I do, it would still take you over 6 years to finish, and my bet is that anyone who currently has 240 WIPs will not stop casting on. In short, dear readers, this is seriously crazy. Of course, we all have our own brand of craziness, and this one at least isn’t harming anyone. Live and let live, after all. It might help keep knitting needle manufacturers and yarn producers in business. It could be that centuries from now, archeologists will find great basements full of thousands of ziplock plastic baggies each containing a knitting needle supporting a few rows of decaying yarn remnants, and come to some interesting conclusions about early 21st century life. I do, however, have one request for the WIP-addicted knitter: PLEASE, sort your project page so the WIPs are at the bottom. This entry was posted in Main and tagged Knitting, Ravelry, WIPs by knitigatingcircumstances. Bookmark the permalink. That is definately cray cray. I haven’t heard this expression; I like it. You’re going to get a lot of angry comments of the ‘no knitting police!’ variety but I have to say I agree with you wholeheartedly, the thought of 240 WIPs makes me feel faint. Isn’t it interesting how we all get something different out of knitting, some are ‘yarn collectors’, some are ‘process knitters’, some are ‘project knitters’ and others are ‘serial finishers’! – this lady likes casting on and I’m sure she feels so happy and excited when she does. I hate casting on and I love to plough on and complete a project in under a month so maybe we should join forces and start churning out those FO’s…. The only thing that makes me slightly sad about this is that I suspect that the happiness of all this shopping, planning and casting on disappears very quickly for such a knitter – they may be afraid of failure or stuck at a certain skill level, so maybe each project is abandoned at the point where the reality of the knitting ceases to match the perfect finished object of her imagination. Or maybe she just gets bored unusually early on. I just hope the happiness outweighs the frustration in the whole process. Loved this post – you’ve certainly a lot on so thanks for taking time to write it Kelly! oh, and don’t you just love the language of Ravelry? You have some very interesting points here. I have written before about the process-product continuum. I used to be much more of a process knitter and have moved more towards the product side, but not completely. I know lots of knitters who can keep a few dozen projects on the burners at any one time and find great enjoyment in the variety. Knitting should be, first and foremost, self-fulfilling (and fun). And, I would be the first to admit that a little bit of crazy can be a good thing. Thanks for commenting! I’m gonna play devil’s advocate and say that perhaps this person has a problem posting finished objects. :-). Heck with all that knitting she doesn’t have time? The scary part is your estimated $30 for yarn, considering perhaps a few $100 projects and how much more would be spent. Probably over 5 figures!!!! Wow! I love this! What a great interpretation. And another very good post. Very interesting and some good points. Take #4- Every 5 or 6 months when I have the luxury of time I will go through all of my stash. I find 1 or 2 WIPs that I am just no longer interested in and will frog them. On another note, my needle stash consists of a set of Denise interchangeables (which I love), a few fixed circulars and a bunch of straight needles. And yes there have been times when I have had to finish one of my WIPs so I could use the needles to cast on another project. Right now I am trying to finish a couple of my WIPs and my reward will be to be able to start some more projects. A very good point, Jocelyn, about frogging the WIPs you are no longer interested in. And I definitely think that the number of WIPs should be limited by the number of knitting needles you wish to own. Good luck on your projects! Are you sure the person isn’t procrastinating at updating his or her projects on ravelry. I know I am guilty of this and just recently realized what a mess my project page is. So slowly I have been trying to clean up my act. I page through and try to make sure that I have put finished when I am done. On older projects I estimated when it was finished. Some of my problem is that I am not. That good with my computer sure I can get around the web and read and learn but some of the finer details mystify my and I have to wait for one of my kids to come over and fix up my messes. And then there is the second problem I hate forms and paper work and avoid them at all cost. Some times after the fun and excitement of a project when the final picture is taken and pasted in place I just move on to my next knit. These are all very good points. I noticed a few sweaters the other day that I neglected to record on Ravelry all together. And I am the queen of procrastination so can certainly see that argument. I love your kitty/knitting avatar! Ha, Jenny! Definitely not you. You are a finisher. Dayana, this is brilliant. I love it! And me, sometimes I read the same book over and over again. Is that why I keep having to rip something out and re-knit it? Can I confess too, all I seem to read are the Jane Austen novels in rotation with Jane Eyre, am reading Emma ATM for the squillionth time! Bingo! :p Naah… we’d all have to read that way, then! OK, let’s see… have you ever knitted the same pattern a few times (like for gifts)? Because I never read a book over, and I HATE doing the same pattern more than once! Actually, when you visit someone else’s project page, Rav will display their projects in the same order as you have your project page set up to display. You can change the display order when you visit someone else’s projects by using the little drop down menu at the top of their project page. Gee, you learn something new everyday. Thank you. I cannot imagine what would possess someone to have 250 WIP’s. I can, however, imagine having enough stash that something that epic could be possible, though.